Goodbye, my darklings, until next year. Please be safe and stay spooky! The Vampire Writers Support Group proudly presents FRESH BLOOD, an eclectic collection of short stories set in a dark, bloodsoaked world full of vampires. VOTE!!! For the Wicked Women Writer's challenge and Master of Macabre contest! This year, the WWW Challenge theme is How Will You Survive? Each of our WWW was assigned an apocalyptic disaster, a location, a helpful object, and an untimely disability. Voting starts September 7th and ends October 7th. Stories will air on podcast #95 September 7th on the http://www.horroraddicts.net show. 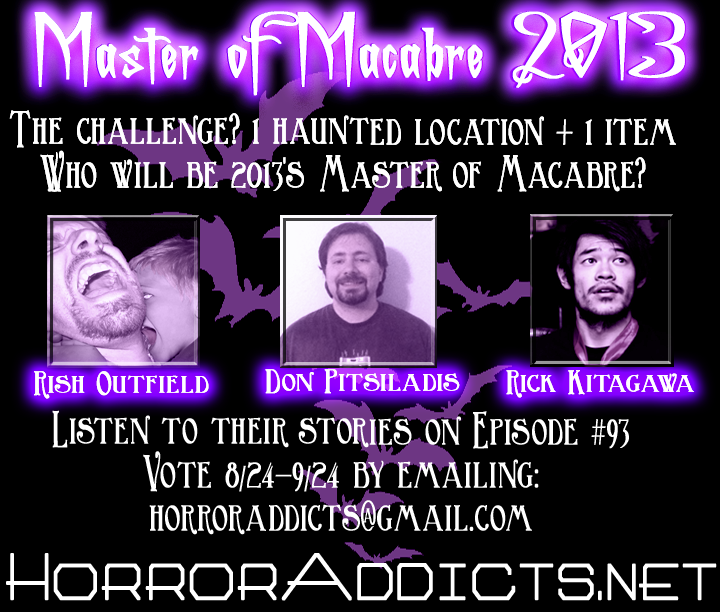 To vote, email horroraddicts@gmail.com. Put “WWW” in the subject line. ***CAUTION*** We Strongly encourage you to listen to ALL the stories. Just when you think you have chosen your most wicked story, there’s another story ready to slap you into the face of fear once again. 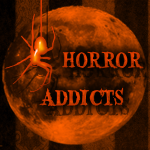 You can also read along with the stories and catch words you might have missed on horroraddicts.net. Be sure and listen to all 13 stories before casting your vote! The winner will be announced on the October 19th Finale of Horror Addicts.net podcast show. Break a Leg, Wickeds! The wicked entrants are listed in order of submission for their completed podcasts. Twenty-five entered and only thirteen rose up out of the ashes and completed the challenge. We are pleased to introduce to you the 2013 Wicked entrants. Leigh M. Lane has been writing for over twenty years. She has ten published novels and over a dozen published short stories divided among different genre-specific pseudonyms. Her traditional Gothic horror novel, Finding Poe, was a 2013 EPIC finalist. Her other novels include The Hidden Valley, World-Mart, and Myths of Gods. You can learn more about Leigh at http://www.cerebralwriter.com/. Shauna Klein - I’m a freelance writer, website designer, photographer and overall Jill of all trades that lives in sunny and stormy Florida. Shauna Klein is my pen name and I’m married with children that have fins, feathers and fur. DM Slate - Danyelle (aka D.M. Slate) resides in Colorado, where she completed a business degree at the University of Northern Colorado. She’s married to her high school sweet-heart, and together they have a young daughter and son. D.M. Slate’s first publication was released in 2009. Chantal Noordeloos is a writer from the Netherlands who1999 graduate from the Norwich School of Art and Design (UK) with a major in creative writing. Apart from work, motherhood and a busy social life that also includes -playing in and organising of- regular LARP (live action role play) events, she has been writing stories and honing her writing skills through workshops, seminars and a lot of writing. Chantal lives in The Hague with her family. Rebekah Webb is a freelance writer from California. When she isn't working on frightening stories or wild comedies about cellophane wearing ladies' men, she enjoys cooking and various other things, possibly including training squirrels to take over the world. The reason she writes instead of some other creative endeavor is because of one simple truth: Writing rocks. Rebecca Snow lives in Virginia with a dwindling herd of geriatricats. Her short fiction has been published in several small press anthologies and online. You can find her on facebook and twitter @cemeteryflower.com and has an online journal at cemeteryflower.blog.com. R.L. Weston lives in Utah amid what her husband refers to as a refugee camp for stray animals. She is a member of the Horror Writers Association and participates in the online critique group critters.org. Maggie Fiske is a secretary, caregiver, musician, creature of the night. I live in Omaha with lunatic cats & a filching ghost. Sumiko Saulson is the author of three sci-fi/horror novels, “Solitude,” “Warmth”, and “The Moon Cried Blood, and short story anthology “Things That Go Bump In My Head.” Born to African-American and Russian-Jewish parents, she is a native Californian, and has spent most of her adult life in the Bay Area. Amy K. Marshall is a former archaeologist and curator (among many other things), current Director of The Craig Public Library on Prince of Wales Island in Alaska, I am also the author of THE FISHING WIDOW (Alaskan Gothic Press 2013). I am an Associate Member of HWA and a member of their Library Committee. My name is Killion Slade, the reigning 2012 Wicked Woman Writer. It has been my sincerest pleasure to meet these talented ladies and be a part of their journey this year. One thing is clear, when it comes to scary – women know how to rock it! We look forward to you listening to all of these amazingly creepy stories and choose who will be your next Most Wicked for 2013. Find out more about Killion's work at www.killionslade.com.